1. Open the message you want the attachments to be removed. 2. 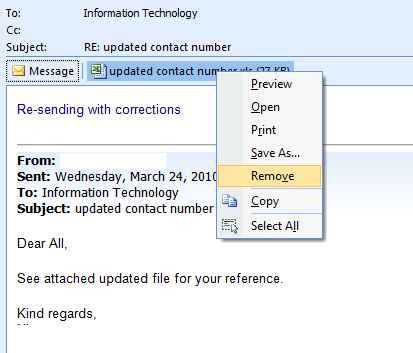 Right click the attachment you want to remove and choose "Remove" from the popup context menu as shown below. Take Note: If the attachment is important, I suggest you backup the attachment first before removing it. You can do so by right clicking the attachment and choose "Save As" on the context menu.